This section explains how to add Microsoft Exchange Databases manually. 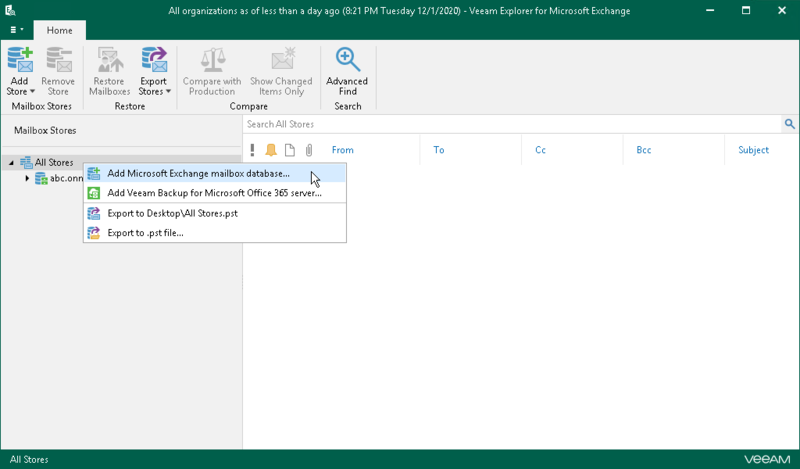 Before adding databases, ensure that Veeam Explorer for Microsoft Exchange has access to the ese.dll file. For more information, see Configuring Extensible Storage Engine. On the Home tab, click Add Store > Microsoft Exchange mailbox database or right-click the All Stores node and select Microsoft Exchange mailbox database. Click Browse to specify the path to the .edb file and Exchange logs folder. Consider that if a database is in Dirty State, you will have to recover it by applying log files. Click Recover and wail until log files are applied, then re-add the database. Ensure that the Write permission is granted to the account being used.